Last week, illegal camping was the crime of the century. Remember that? That was when mayors and university chancellors were talking about how threatening the actions of Occupy protestors were, in order to justify beating and pepper-spraying them. This past weekend was a different story. Thousands camped out in front of Best Buys and Wal Marts, spending part of their Thanksgiving holiday swarming stores for bargains. Occupy Wall Street protestors living in tents in Zucotti Park were described as an uncontrollable mob but, apparently, when a large unruly group of people descend on a store, it’s just part of the holiday season. The irony is too great to describe, so I’ll just let it sink in. The message is clear: if you want to protest the exploitation of average Americans by corporations, pick up an XBox on your way out. The police won’t mind you’re illegal camping one bit, although you might still get pepper-sprayed. If you go camping, don’t be surprised if a police officer in riot gear comes after you. 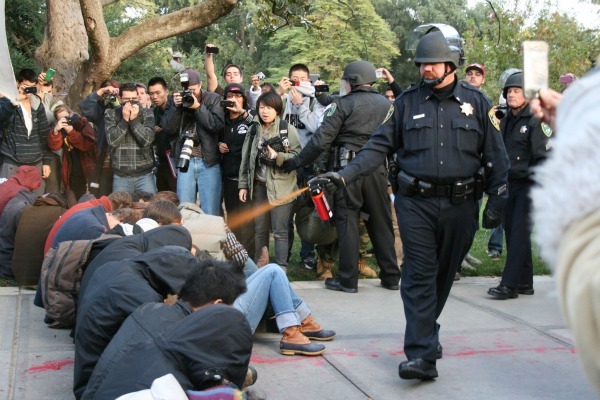 Political and law enforcement officials all over the country have gotten sick of the Occupy movement and, as the pepper spraying of seated protestors at U.C.-Davis demonstrates, they aren’t afraid to use disproportional amounts of force. I’m sure people who grew up during the 1960s are experiencing some deja vu. Seeing police in riot gear forcibly clear protestors is nothing new in this country; events like the Kent State shootings and the protests at the 1968 Democratic Convention have gone down in history as classic examples of “The Man” keeping people down with acts of violence. No one’s been shot yet, but the police response at U.C.-Davis and the other Occupations was still completely inappropriate. The use force exceeded the nature of the “crimes” the protestors were accused of. That’s true, but is pitching a tent in a public park a serious crime? The British allow a semi-permanent encampment outside Parliament, so it can’t be that much of a security threat. Littering is illegal too; will I get pepper sprayed or beaten with a billy club for that? Enforcing the law is one thing, treating nonviolent protestors like they’re part of a prison riot is another. The many videos of the U.C.-Davis confrontation show that protestors posed no threat to the police. They were sitting with their arms entwined. Yes, that meant that they weren’t going to move, but who expected them to? There is a difference between protesting and posing a threat to an officer’s safety. This was clearly a case of the former. U.C.-Davis chancellor Linda P.B. Katehi is conducting an investigation, but I think that is unnecessary. Not pepper spraying a seated college student that you could probably pick up and throw like a football seems like common sense. “Investigating” clouds the issue. What is really happening is the same thing that happened in the ‘60s: protestors are making our political leaders look bad, so the leadership is trying to get rid of them. What makes the response to Occupy so pathetic is that this movement is much less radical than some of its ‘60s forebears. Most Occupy protestors aren’t talking about revolution, they just want the government to work for them and not corporations. I’m not sure, but I think there is a Constitutional precedent for that. College protestors used to overthrow administrators, now they camp out in public spaces. As far as protest movements go, Occupy is pretty reasonable. If politicians can’t even handle this, maybe it is time for a change. The amorphous protest movement known as “Occupy Wall Street” is spreading from downtown Manhattan to other cities, and everyone is taking notice. Media coverage has increased, and the protestors have a new ally: the unions. 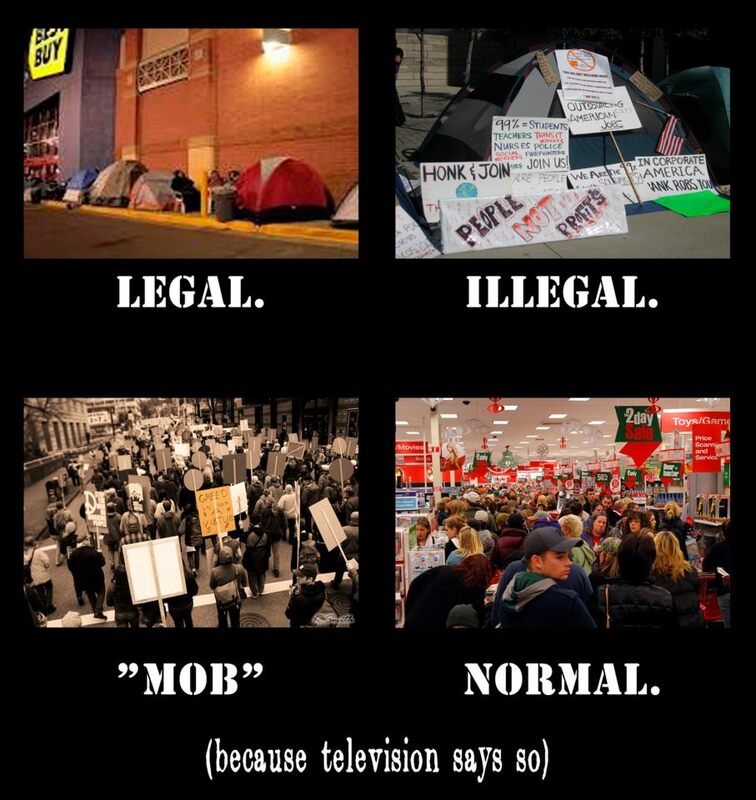 Occupy Wall Street is getting very difficult to ignore. That is a very good thing for the people of the United States. When I first heard about Occupy Wall Street, I cynically asked “what will it accomplish?” I now realize that it doesn’t matter. After years of economic stagnation and political bickering, it seems like many Americans have been convinced that there is nothing they can do to get corporations or politicians to listen to them. Instead, we’ve turned on each other. We denied teachers the right to collective bargaining because they get perks private sector workers don’t. We hesitated to give fellow Americans healthcare because it might be too expensive. We cheered at the mention of prisoner executions. If nothing else, Occupy Wall Street will remind Americans who they should really be angry at: the people who ruined the economy, took our money, and greedily hoarded it at the expense of the non-CEOs of this country. We need to stop eyeing our neighbors suspiciously and start making life difficult for corporate interests. They only care about profits, but we need to remind them that doing business in the United States of America is about more than that.